Students read text that describe the parts and functions of the microscope and ask them to color the parts as they read. Microscope image includes the objective lenses, eyepiece, diaphragm, stage, and adjustment knobs. Each coloring instruction is followed by a checkbox to help students pause and color the appropriate structure on the diagram. 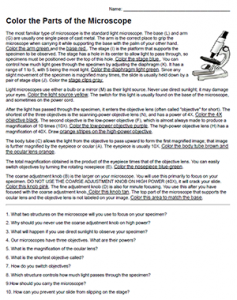 This is a very basic level worksheet that I have used in my introductory classes who need extra practice on learning the parts before they are ready to head to the lab. Worksheet has questions and must be colored according to the directions.